Whilst I am unable to comment (or fathom) the reasoning behind the "logo" at the Supreme Court, I can with certainty say that a new stronger design of the Royal Coat of Arms is now in use and available to architects building the new law courts across the United Kingdom. The previous design, which has appeared on everything from Court buildings to tomato ketchup bottles, was originally drawn in 1952/3, and was approximately 6x4 inches in size. This is why it had a tendency to look somewhat weak, or soft, at larger sizes. The new drawing was commissioned specifically to be utilized in any number of ways (etched, sand blasted, cast, carved or painted etc.) at sizes ranging from 500mm to approx. 1500mm - although it would probably work at larger sizes if handled correctly. 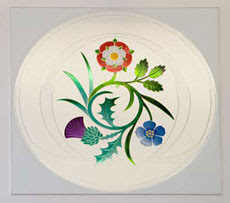 The artist was chosen for his ability to bring strength and vitality to his work, particularly heraldic beasts, and I think, and would hope others will agree, that the new version will meet with approval from all those who have been disappointed by the symbolic floral logo of the Supreme Court. The remedy, as will soon be seen on new court buildings across the UK can be seen, albeit in a small version, on Flikr, on Sable Musimon's page.